After experiencing the magic of the Sunday Champagne Brunch at Ellygnton’s earlier this year, I was excited to return to the Brown Palace Hotel for another culinary experience. 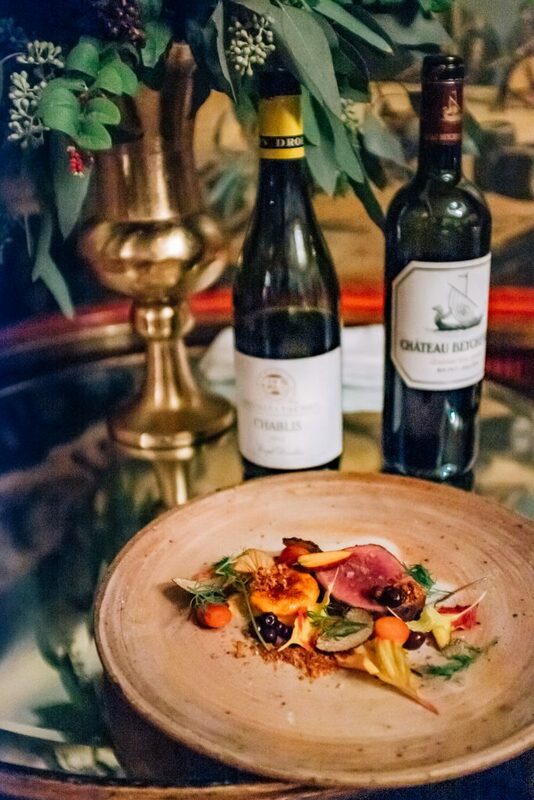 This time I was invited to dine at the elegant and regal Palace Arms restaurant to sample their new seasonal “Fall Harvest” dinner menu created by Chef Garrett Kasper. Please note: Financial compensation was not received for this post. 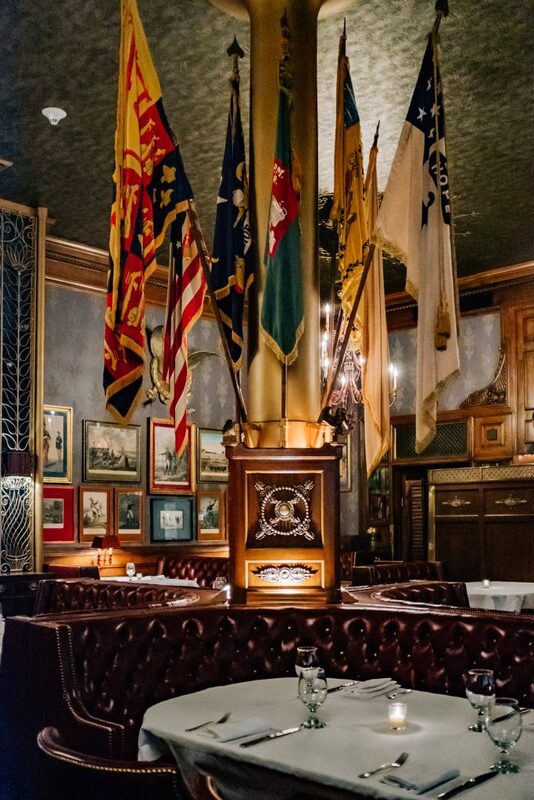 I was invited by the PR firm working with Palace Arms at the Brown Palace Hotel to come in for a meal on the house. Opinions expressed here are my own. 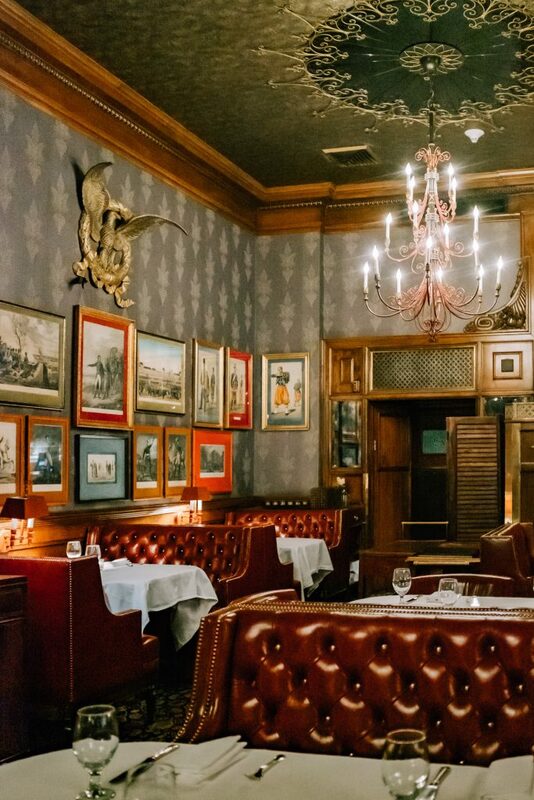 Every eatery at the Brown Palace has a distinct dining approach and atmosphere and the Palace Arms is decidedly the Brown’s most upscale fine dining option. The elaborately decorated Napoleonic-themed space showcases various types of wartime antiques and artifacts including flags, uniforms, and even a set of dueling pistols believed to have been owned by Napolean himself. 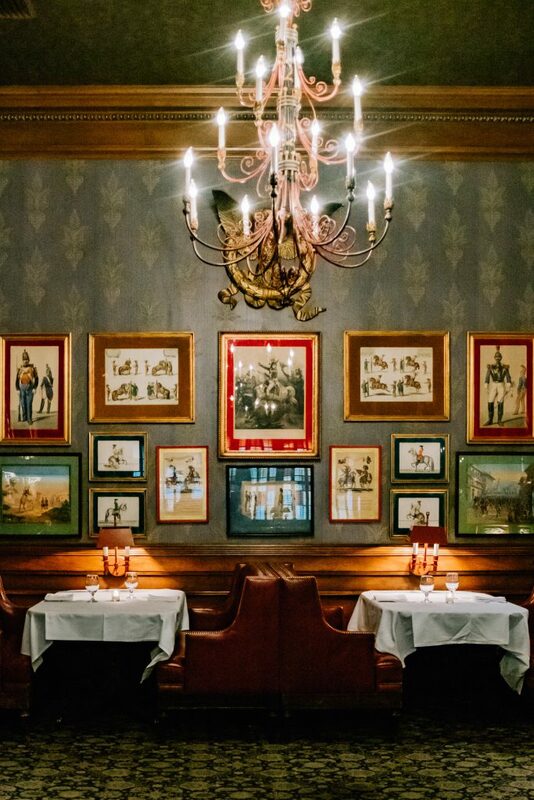 Those items, combined with the glossy burgundy leather tufted banquettes, booths, and chairs and a darkened dining room simply illuminated by a handful of overhead chandeliers and smaller intimate tableside mood lighting, creates an environment where Palace Arms diners feel as though they have been transported to a bygone era of European history. 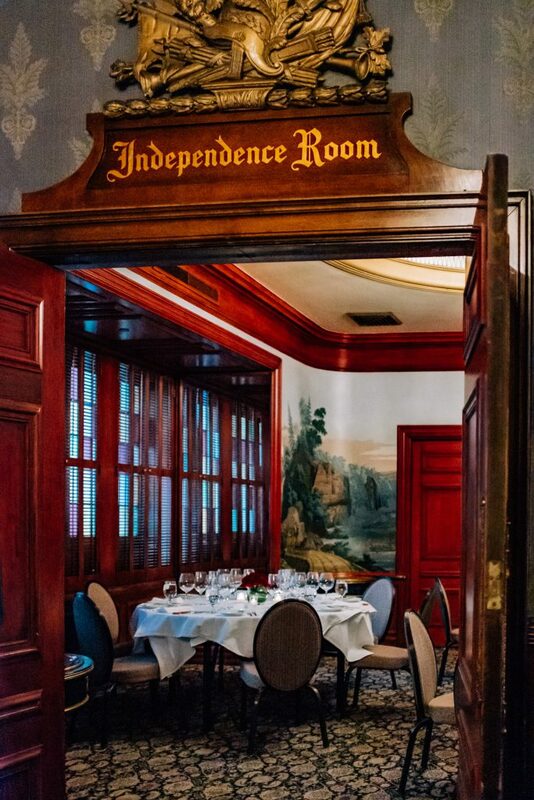 But for our meal, we dined off the main dining space in a private dining area called the Independence Room which honors the beauty of America thanks to the hand-printed Zuber & Cie wallpaper decorating its walls. 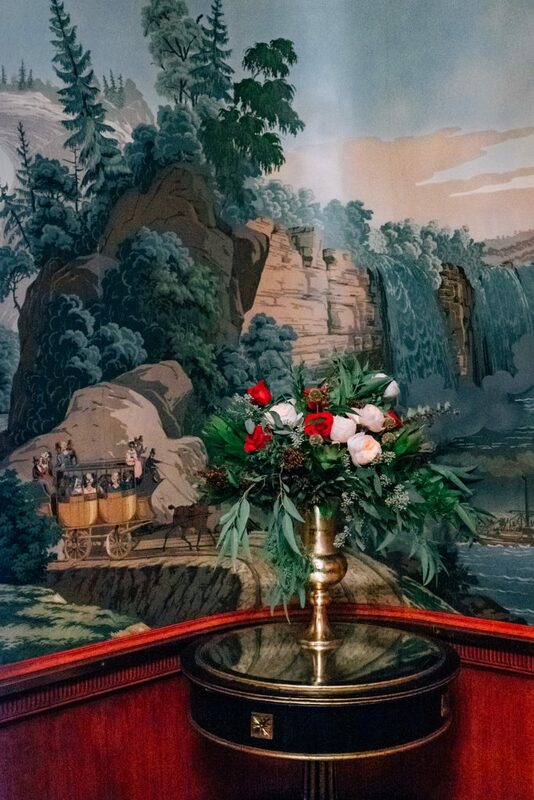 Taken from the “Vues d’Amerique du Nord” panoramic wallpaper the French company introduced in 1834, the room features idealized depictions of a bucolic American landscape from the Jeffersonian era. While the staff could have gone on a great deal longer about the history of the hotel and all the historical details of the restaurant, our main focus quickly shifted towards the primary reason we were there – the food. 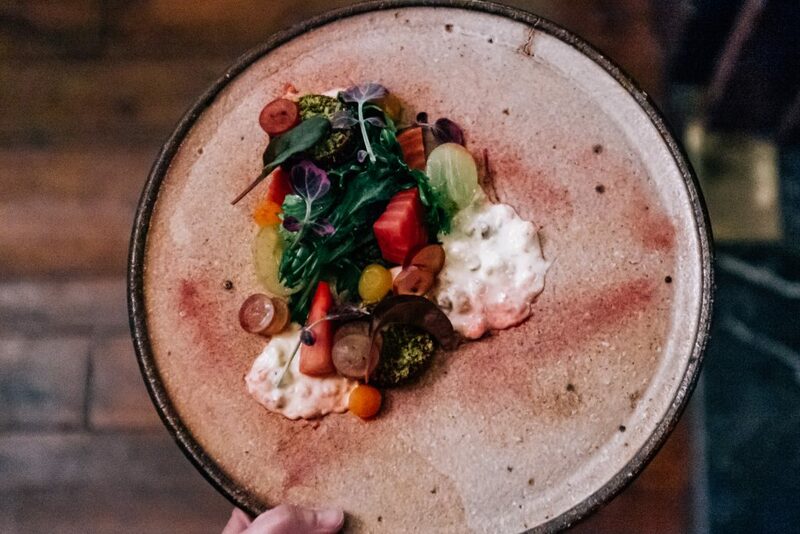 The first offering in our four-course* version of the Chef’s Tasting menu was a colorful Fall Salad showcasing beets served three ways served on top of a pistachio yogurt. Bright and light, a great way to start off the meal. Next, I tried the Moulard Duck, which was probably my favorite dish of the night. 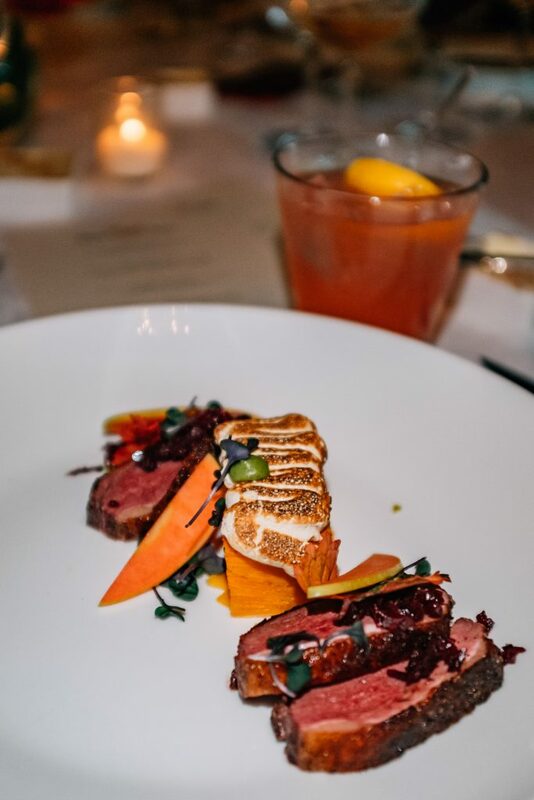 The best part of each bite was mixing the deep rich flavors of the slightly fatty edges of the meat with a bit of the beautiful sweet potato terrine from the plate. Next was another meat dish – a Seared Elk Loin. This perfect autumnal dish was served with a butternut squash brulee, sage, walnuts, and a sprinkling of preserved huckleberries, adding a wonderful dash of earthy sweetness to the entree. 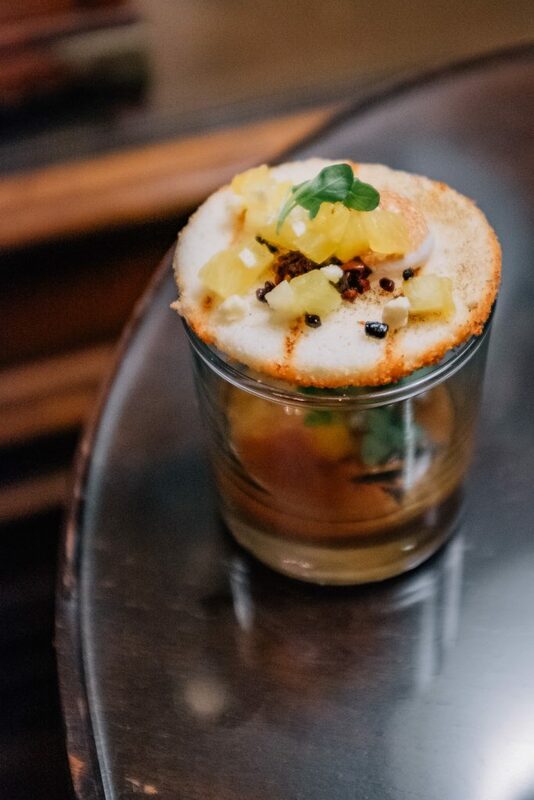 To close it all out was Chef Garrett’s playful take on a Pineapple “Upside-Down” Cake. 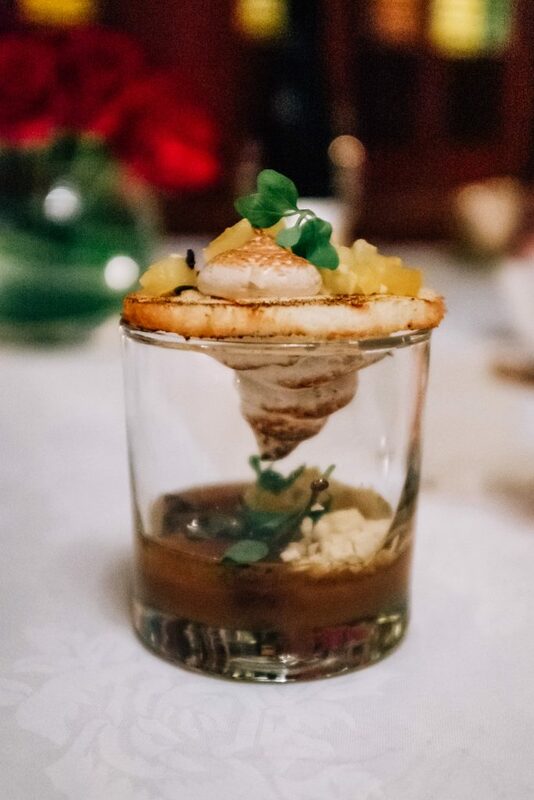 Inspired to make a truly topsy-turvy version of the classic dessert, Chef Garret placed the sweet topping (made with caramel, preserved Colorado cherries) at the bottom of the glass, and topped it off with a sponge cake sandwiched between toasted meringues and sprinkled with small pineapple chunks. You eat it by pushing the cake and meringue layer down into the glass and mixing everything around. A super fun way to end the meal! My meal at the Palace Arms was definitely memorable. The space itself is very special and I felt like the fanciest person alive sitting in that space for the length of my meal. The service is impeccable as you would expect and the staff was very accommodating to my non-alcohol drinking needs, even going so far as to make me a special pomegranate mocktail. As I stated in my Champagne Brunch review, prices at many of the Brown Palace establishments are on the high side so be prepared to spend a pretty penny on this Chef’s Tasting menu meal. The six-course version will run you $80 and the eight-course version costs $100. Course wine pairings will cost you $60 and $80 respectively. Are you getting the city’s most envelope-pushing cuisine? Nope. But that’s not what the Palace Arms is trying to do. 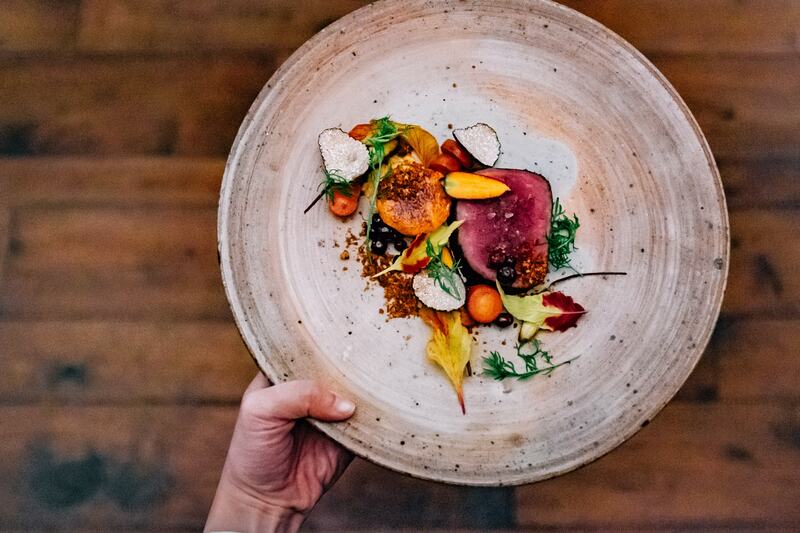 They are aiming to deliver a noteworthy dining experience steeped in tradition, legacy, and timeless elegance. 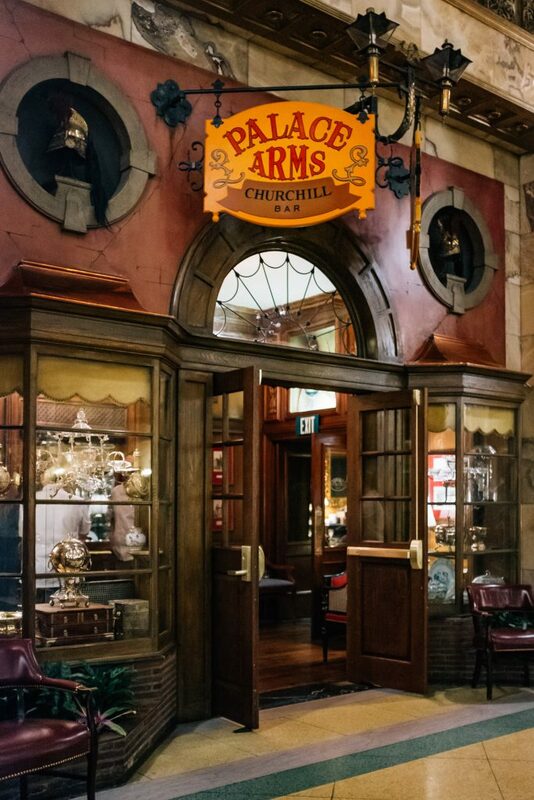 I think a meal at the Palace Arms (or any type of visit to the Brown Palace) would make for a delightful treat dinner during the holiday season for those who appreciate high-end service and tasting some newly refined takes on classic fine dining menu items.